Nearly every natural foods store, supermarket, and produce grocery offers a wide array of mushrooms. Shiitake, crimini, portobella, and oyster mushrooms are among those that were once exotic but are now readily available. Mushrooms are a fantastic hot appetizer ingredient. Their appearance, flavors, and textures aren’t all that make them so appealing. Combine the first 4 ingredients in a medium mixing bowl and stir together. Wipe the mushrooms clean and remove stem ends that are dried up or don’t come clean. If using shiitakes, remove and discard the stems. Leave the mushrooms whole (though if you’re using large portabellas, slice them 1/4 inch thick). Combine the mushrooms with the lemon-garlic mixture and stir together. 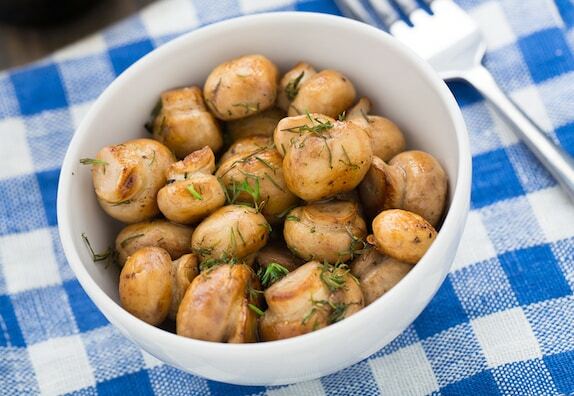 Arrange the mushrooms in a shallow, foil-lined pan and pour any excess marinade over them. Broil under a preheated oven broiler or a toaster oven broiler for 4 minutes, then stir. Broil for another 4 to 5 minutes, or until the mushrooms begin turning dark and are touched by charred spots. Remove from the broiler and transfer to a covered serving container until needed.